Developed from the ground up using the latest in web responsive and cloud technologies, it works on any screen size device. Flex provides richer functionality and delivers a faster, more user-friendly experience. It takes real estate websites to a whole new level with integrated property alerts, newsletters, content and customization abilities. When most buyers start their home search online, make it count with Flex. Flex templates can be replicated and fully customised to work in any country. Because it runs on the worldwide AWS Cloudfront content delivery network (CDN) the user experience will be consistent from anywhere around the globe. You can even use your own local front-end developer for complete design freedom. 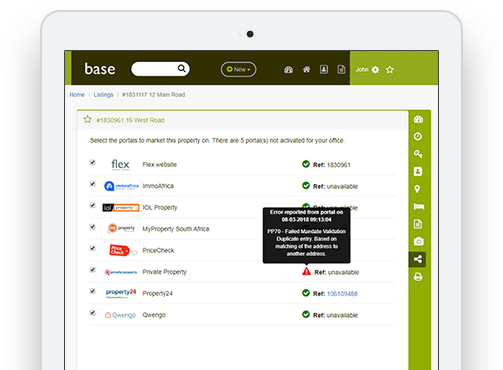 It’s a match made in the cloud: Load your listings once from anywhere using Base, and update them instantly to your Flex powered real estate website and partner portals. Edit agent profiles, news and more through one system.